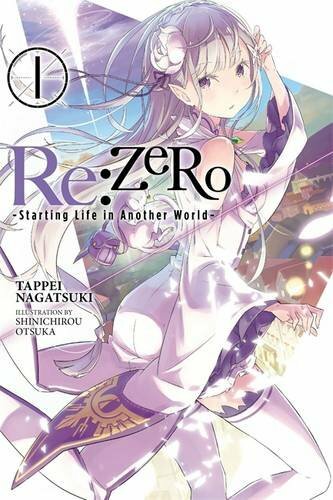 This review is for the first volume of Re:Zero by Tappei Nagatsuki (with artwork by Shinichirou Otsuka). The English edition was released by Yen Press in July 2016. The second volume has just released (November 15, 2016), and will be followed by the third in March 2017. So far, there are ten volumes available in Japan. Re:Zero was the light novel everyone voted for the most in the summer reading program poll for August. This wasn’t too surprising, considering the series was in the middle of a popular anime adaptation at the time. 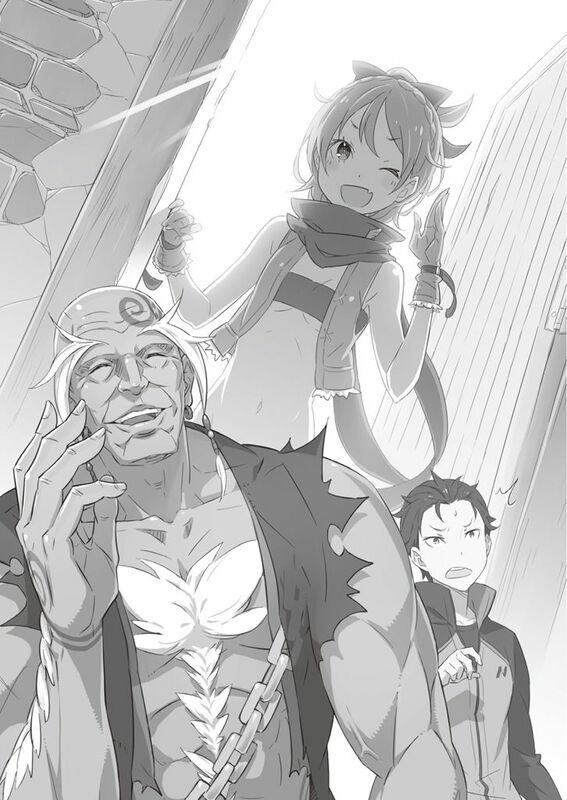 The Re:Zero anime was a big hit, but how does the first volume of the light novel series hold up? The setup for this series is essentially the combination of two very well-known premises: 1) trapped in a fantasy world (AKA “the Narnia”), and 2) caught in a time loop (AKA “the Groundhog Day”). In Re:Zero, our protagonist is a downtrodden boy named Subaru, who for reasons unknown finds himself suddenly transported into a world of medieval Europe swords and sorcery. He is all-too-familiar with the tropes of this fantasy subgenre, and immediately expects his adventure story to play out with him as a valiant hero wielding fantastic magical abilities. His new reality isn’t so kind, however, as everyone sees him for the uninspiring imbecile that he is. He does at least get a special power though: the means to jump back in time. Unfortunately, this ability only activates upon his death. So in order to save the day–or in the case of this volume, to keep some of his newfound acquaintances from being killed by an assassin–Subaru has to die. Repeatedly. Reviewing this novel is a little tricky, because overall I didn’t particularly enjoy reading it. But I was curious about some of the things that were introduced, at least enough to go ahead and start watching the anime adaptation people had been praising. And truth be told, I really enjoyed the anime. To some degree I feel the anime adapted the story in a way that worked much better for me than the novel did, and to some other degree I found the story in general seemed to improve the further along it went. (The most memorable events IMO were definitely in the final arc.) With all that in mind, I’m not certain how critical I should be in my review here. I’ll go ahead and just list the biggest things I liked and disliked while reading Re:Zero volume 1. The author sometimes subverts the tropes of the subgenre, sometimes he plays things straight, and sometimes he outright mocks the whole premise. Keeps readers on their toes. The action is impressively well-conveyed. I found the “grand finale” rather exciting to read. Loads of unanswered questions. I get that the first volume of a long series should have a plot point or two unresolved, but WOW, the author did not want to throw one single bone here. Subaru is incredibly dumb, to the point where it’s at times a bit aggravating. I ended up loving the character in the anime actually, but for the light novels (or at least for this volume) I found him exasperating. For a good deal of this volume (particularly in the first half), the pacing felt nauseatingly slow. It’s mainly an issue with repetition in the prose, I believe. Something will happen, and then the text will dwell on that one thing page after page. Of course, the fact this story works with a time loop premise doesn’t help matters, but even then it’s all just too long-winded. I think my final verdict is if you like “trapped in a fantasy world” stories, definitely give this a try. If you don’t particularly care for that subgenre though, give the anime a try instead.